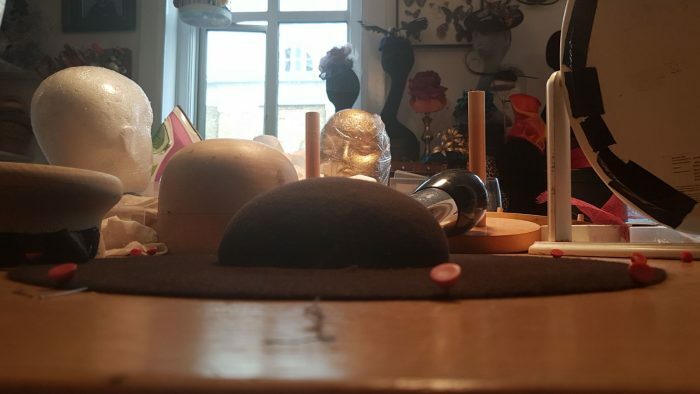 One Thursday a few weeks ago I was called up my the extremely talented costume designer Alex Noble with an enquiry about 20 hats for Paloma Faith’s music video. ‘Not a problem’ I replied, ‘when do you need them?’…. ‘Next Saturday’… Gulp! 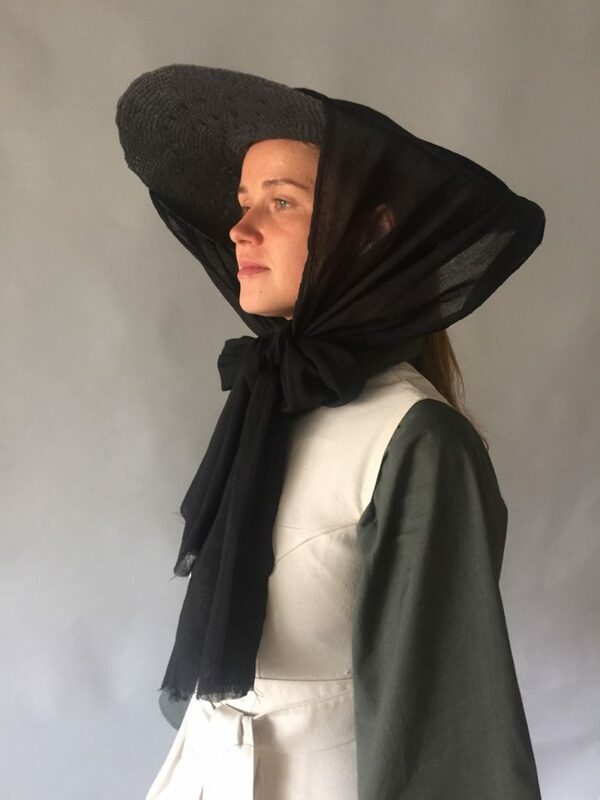 The brief was: ‘handmaiden, grey, very large, stiff round brim and shallow crown’ and together we agreed the best material was felt. 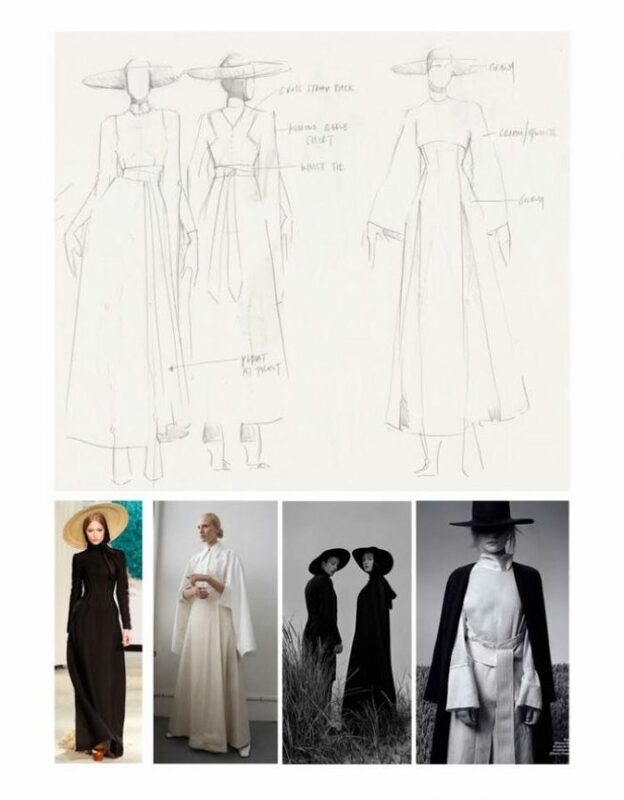 Alex sent over some gorgeous design drawings and his moodboard, which confirmed the vision that had conjured up in my head! As I awaited confirmation on the job (Alex had to confirm with the director that they were aligned with the vision, who i’m sure had to confirm with Paloma) I wasted no time in practicing with a felt I had in the studio to check how wide I could stretch the brim, and if I could block it all in one to save time, or whether it needed to be blocked as hats are traditionally blocked: the crown and brim separately. 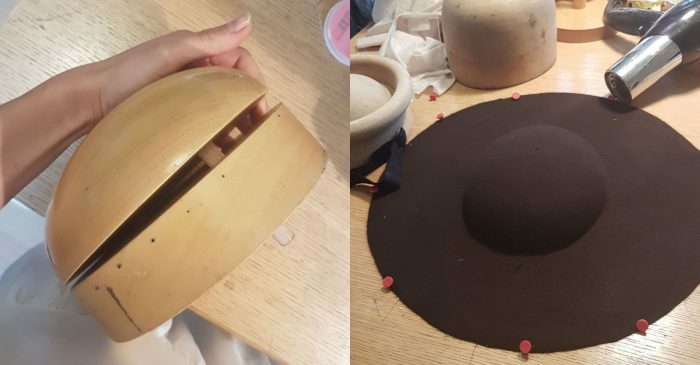 Fortunately the felt stretched as desired and I got the following fabulous result – not to say it was easy – nooo, don’t let anyone tell you millinery is easy – stretching felt out this much is a workout! The next day finally the phone rang and we got the go-ahead so I called my favourite suppliers and was told ‘no grey felt left’ – Yikes! So I tried another, and another, and another, until I’d exhausted ALL millinery suppliers in the UK – NO GREY FELT IN THE COUNTRY!!! I tried my hardest not to panic but instead to think of alternative solutions. I raided my boxes of materials and found straw! So, I was back on the experimenting process! The straw thankfully took to the shape just fine, so with Alex’s blessing I went off to Luton to pick the supplies. (Luton has always been the hat making capital of the country). There are lots of different straw weaves to choose from! So then the work began: stiffening, steaming, blocking, drying, stiffening, drying, spraying, drying: repeat x 20! I had used up every inch of flat space in the studio and an insane amount of stiffener but finally they were done! The funny thing is, in the video you can either see a really close up of Paloma Faith wearing one, or super blurry background shots of the models wearing them – oh well, c’est la vie!